In the last recruiting cycle, Darrian Felix, easily one of the best athletes in the country, signed with the Oregon Ducks on Feb. 1, 2017. It is chapter one in the books of a career that will no doubt end successfully in the NFL. Felix must first do at Oregon what he did at Ft. Myers, Florida … dominate. The city of Fort Myers is in Southwest Florida and has a population of about 77,000. The high school is one of the oldest in the state. The Green Wave has accumulated the fourth-highest number of wins in Florida state history, an impressive 646 games dating to 1920. To be one of the best players to ever come out of a school with the history and tradition that this South Florida powerhouse has is an indication of Felix’s talent. As a sophomore, he accounted for 19 touchdowns and was named All-Southwest Florida (second team running back). 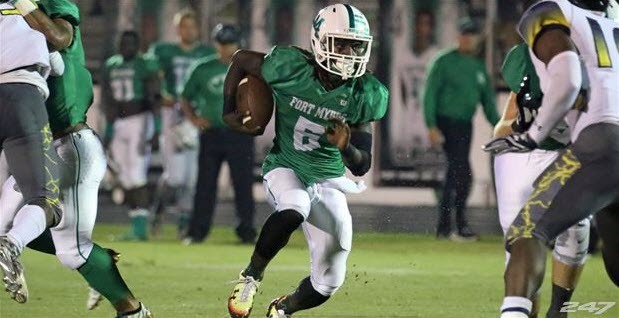 His junior year was even better as he was voted All-Southwest Florida (first team utility) , All-FACA District 16 (utility), and All-State (third team running back). 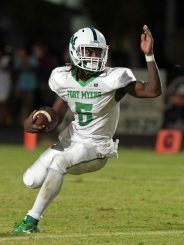 He took it to another level as a senior rushing for 1,477 yards and 20 touchdowns, along with 200 receiving yards and another three touchdowns. For his efforts, the young man, voted No. 2 on the News-Press/Naples Daily News “Big 15,” earned nearly 30 scholarship offers. 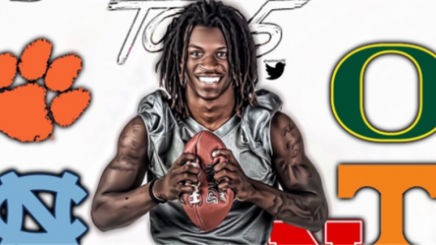 Felix committed to Oregon on Jan. 8, 2017 over the likes of North Carolina, Nebraska, Clemson, and Tennessee. Darrian Felix is a well-built athlete. He has been reported by most media outlets as 5’11” tall and between 189 to 195 lbs. ESPN lists him at 189 lbs. and Andrew Nemec of The Oregonian states that he is 194 lbs. These are excellent size numbers for an all-purpose running back. The Nike camps where they test speed, power, agility, reaction, and quickness (SPARQ) have been going on for a number of years. It’s a gauge of athleticism, though it could be argued that it is geared towards a certain body type. For example, an offensive lineman will probably never outscore a running back. It’s just the way the scores are weighted. Attaining a score of 100 is difficult and equates to a great athlete. A score of 125 belongs to an elite-level guy. Not many kids score over 130 and you’re talking about a “freak” athlete. The “rarified air” of SPARQ is a score of 140-plus. To my knowledge, only one Oregon football athlete has ever scored over 140 and that was Kirk Merritt who scored an astonishing 148.83 in 2014. Has anyone ever scored over 150?A Texas A&M recruit Devante “Speedy” Noil did it in 2013, with an unheard of 153.90. The purpose of this exercise is to provide some perspective on just how great an athlete Darrian Felix is. He has participated in these Nike SPARQ testing combines at least three times over two years and scored between 128 and 139 every time. Not only are these “freak” athlete-level scores, but they demonstrate an impressive consistency level. Most high school kids need a lot of work on route running and certainly Darrian Felix is no exception. However his natural ball skills are excellent. In the video above, he high points in the flat on a poorly thrown ball. Throughout his tape, he demonstrates the ability to catch the ball in his hands (as opposed to being a “body catcher”). He doesn’t fight the ball and he has terrific ability to track the ball in the air at all three levels. Felix does a nice job in the video above to “float” while waiting for the cutback lane to open. Patience and vision are key attributes of a natural cutback guy. Again you’re either born with it or you’re not. The great return guys blow through the first wave on a kickoff return. One missed tackle or one correct block is all that it takes and he is gone. The returners that slow down and “look” for a hole to develop almost never get through the wall. The video above is from Darrian Felix’s sophomore year. He’s a natural. A smart coach will figure out ways to get the ball in the hands of the best athlete on the football field as often as he can. And that includes lining him up in the “wildcat” formation. Felix makes it look easy in the video above. Here, Felix uses his 40-plus vertical to knock the pass away while playing cornerback. Impressive ball skills for a sophomore. Make no mistake about it: with his speed, vertical, and size he has elite cornerback triangle numbers. Darrian Felix demonstrates pure speed. Notice he even beats the angle of pursuit by the safety. He flashes his sub-4.40 second clock throughout his tapes. Felix demonstrates fine balance in the video above. Notice he holds the ball “high and tight.” This is great technique, especially in heavy traffic. In the two videos above, Felix demonstrates the ability to carry the ball with equal ease in either arm. This is an important skill as running backs are taught to carry the ball to the outside or away from the nearest tackler. In the two videos above, Darrian Felix really flashes one of his best attributes — his ability to see the holes open, make the cut and get vertical to the second and third levels. He is elite at this. 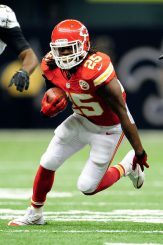 Jamaal Charles who was drafted in the third round (No. 73 overall) of the 2008 NFL Draft from the University of Texas. Other running backs of similar triangle numbers (height, weight, and speed) that compare favorably to Darrian Felix are Lamar Miller who was taken in the fourth round of the 2012 NFL Draft by Miami, LeSean McCoy (second round – 2009) by Philadelphia and Chris Johnson who was a first-round pick of the Tennessee Titans in 2008. Darrian Felix is a rare athlete. He is a dynamic playmaker and a perfect fit for the slot/wingback/running back position that he was recruited for to Oregon. He has been clocked at under 4.40 seconds in the 40-yard dash (electronic) which is elite speed. He combines great athleticism with a little swagger. This is the type of guy that you hold your breath every time he touches the ball. Felix should see the field early in his career at Oregon.